One of the last songs recorded by Bon Scott. Some of the best blues licks Angus ever played. Good songs Drew. I quickly got tired of AC/DC when I was younger and they were hot, due to the over saturation they got on the radio. Pippy, a "radio" is what people used to use in olden times to listen to music. Anyway, I have experienced a renewed love for AC/DC in the last few years for several reasons. Not the least of which is the really do know how to rock and to roll. Another really cool reason is that Brian Johnson falls into one of my favorite demos, rock n roller/race car driver/really cool guy who helps people. He has his own real deal race team, racing Daytona Prototypes, Brian Johnson Racing, and is affiliated with the Fifty Plus Racing Team. 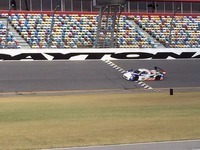 Below is Brian at the wheel of his Highway to Help DP racer at Daytona last year. He also heads up some cool charities like Race To Recovery, which successfully placed a team of disabled British combat vets in the Dakkar Rally a few years ago. They didn't win, but they finished. Many count a finish as a win in that ridiculously grueling race. He also heads up The Highway to Help Foundation at Fifty Plus Racing, a charity devoted to the cure for Alzheimer's. Brian is a DP class driver along with the likes of Dorsey Schroeder, Jim Pace, Byron Defoor, and David Hinton. So he's the real deal. I'm just sayin. He is also buds with my Cuz'n.